We can offer same day service skip bin hire Carindale! Home renovations are an exciting task to undertake. All the planning, the aesthetic choices and the actual improvements result in a beautifully remodeled home. We must remember that as the new comes in, the old must leave to make space. That shiny, new hardwood floor required the builders to remove the carpet. Your new hardwood floor is there, but where is your old, ragged carpet supposed to go? The easiest choice is to go with a skip bin hire Carindale, but how are you to know which one to choose? The choice is easy with Lightning Skips! We are a family owned and operated business in the skip bin hire industry, servicing Carindale and surrounding areas. Lightning Skips have been in business for over 12 months and we don’t see ourselves stopping anytime soon. We chose the name Lightning Skips as a representation of our goal as a company: speed. We know you may need a skip at the drop of a hat. So we have dedicated all our experience to getting a skip to you as soon as possible and collecting it as soon as you are finished. We offer a fixed-price skip bin with no extra charges. We believe our skip bins should fulfil the simple purpose of enabling you to get rid of your waste. If you hire a skip bin, we feel that you shouldn’t have to pay exorbitant prices for wanting to get rid of your waste. Thus, we make a commitment to giving you an affordable service, with all the benefits of a professional, customer-focused company. To maximise your cost to waste ratio, we advise that you take advantage of our wide array of skip bin hire sizes. If your job is small and you only need a bit of waste taken away, then benefit from our mini skips. These mini skips range from two to four cubic meters and are among the smallest size bins that you can hire. If you have a more comprehensive job, we have bigger skip bins for hire. Our largest size available is the eight cubic metres, making it well suited to multiple room renovations or large garden overhauls. Our bigger bins include doors to make access and dumping easier. If you need some help deciding which skip hire is best for you, you may consult our formula LxWxH calculator. Once you decide what size of skip you’ll need, give us a call or get a quote through our website. We guarantee that we’ll deliver you a fresh, clean skip within 24 hours of contact. In fact, if you’re able to call us before midday, we may be able to deliver your skip on the same day! Before you hire a skip bin, please keep in mind the types of waste that require disposal. While we can take away most types of waste, there are certain types that we cannot transport. Please refer to our website for a list of the types we accept and cannot accept or relevant legislation online. 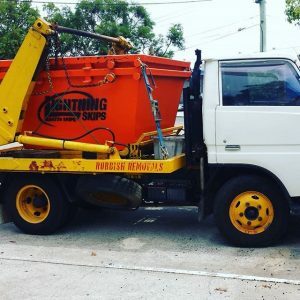 Choose Lightning Skips if you need a skip bin hire Carindale area. Call us on 0472 975 477, or head on over to our homepage and use our online booking form to reserve one of our bins or get a free quote. We offer unmatched speed and quality of service without breaking the bank.